Gold is rising against the weak USD and this influences AUDUSD as well. 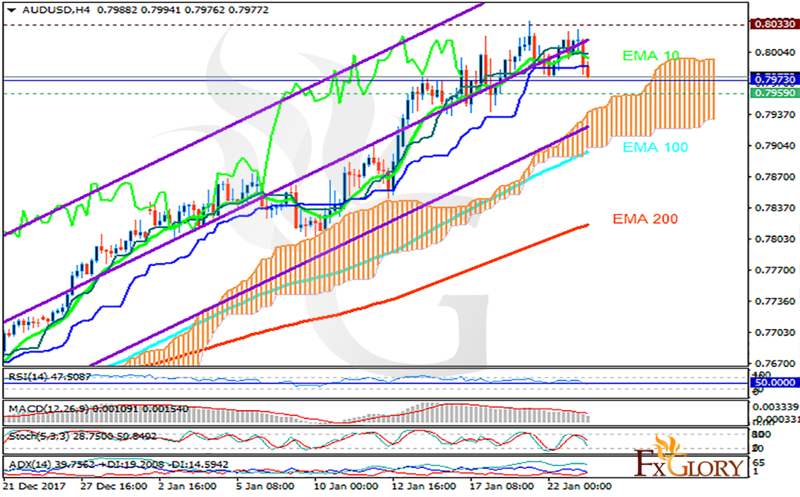 The support rests in 0.79590 with resistance at 0.80330 which the weekly pivot point at 0.79730 is located in between the lines. The EMA of 10 is moving with bullish bias in the ascendant channel and it is located above the EMA of 100 and the EMA of 200. The RSI is falling below the 50 level, the MACD indicator is in positive territory and the Stochastic is showing downward momentum. The ADX is showing buy signals. The price is in the Ichimoku Cloud and below the Chinkou Span. The Tenkan-sen and the Kijun-sen are both showing a horizontal trend. There are mixed signals presenting by the indicators. Most probably, AUDUSD will continue its bullish trend towards 0.81 but if the pullbacks begin, the price will decline targeting 0.78.